Find huge winning when you explore your dark side in the 25-line video slot, Reel Rich Devil from WMS. The Devil can often tempt you in giving up things like your soul for the promise of things that you really want in life. What do you really want in life... is it riches beyond your wildest imagination because that's what might happen in this fun slot game! Find huge winning when you explore your dark side in the 25-line video slot, Reel Rich Devil from WMS. The Devil can often tempt you in giving up things like your soul for the promise of things that you really want in life. What do you really want in life… is it riches beyond your wildest imagination because that’s what might happen in this fun slot game! The game has been around for a while in land-based casinos and that is testament to its popularity with players. Its made its way online now and features the same great colors and graphics that fans already know. There is a the female temptress devil, diamonds, rubies, emeralds, devil’s fork and more symbols decorating the reels. There is also some great features in this game. 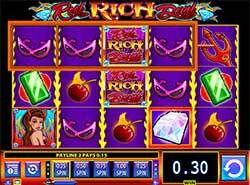 Devil’s Wild – Get Wild with the Reel Rich Devil game logo as it’s wild symbol. This symbol will substitute for all other symbols except the Feature symbol and only appears on reels 1, 3 and 5. Fireball Feature – The Fireball looking symbol is the feature trigger symbol. 5 or more scattered Feature symbols anywhere on the play area triggers the Reel Hot Feature and the possibility for additional rewards. If you hit between 11-15 for example, not only do you trigger the feature but you’ll also earn 200x your Total Bet!